After construction of a railroad line South from Roseburg in 1881-1883, Solomon Abraham, the local right of way agent, platted the community and named it Julia after his wife. After a dispute with Abraham, A.F. Morris, the Chief Engineer for the railroad, changed the name to Glendale. A Julia post office was established in February of 1883, and its name was changed to Glendale in August of the same year. L.D. Montgomery was the first Postmaster. Fire destroyed much of Glendale’s business district in 1928. Glendale was quickly rebuilt. In the 1880’s, Russian-Jewish immigrants came here trying to escape the anti-Semitic rule of Alexander III. New Odessa, the first Jewish Communitarian Community in America settled near Glendale. By 1888 the New Odessa Community disbanded due to political and religious divisions. 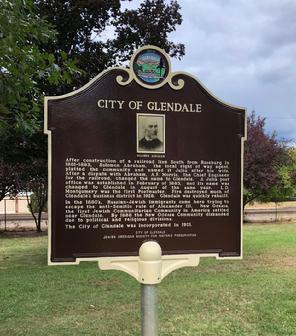 The City of Glendale was incorporated in 1901. Glendale, Oregon The New Odessa brethren came to America to establish a utopian ideal of freedom. They found that the American pull of individual freedom was even greater.